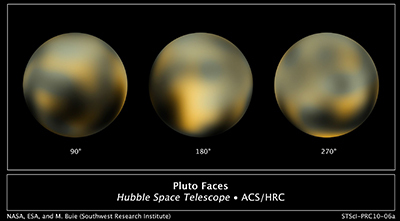 Pluto's entire surface, as constructed from multiple NASA Hubble Space Telescope photographs taken from 2002 to 2003. Planetary exploration is an historic endeavor and a major focus of NASA. 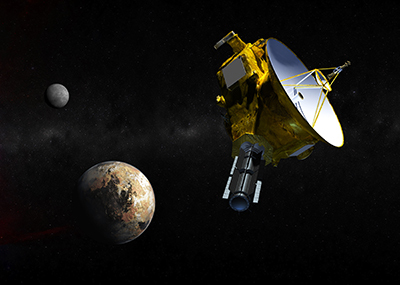 New Horizons is designed to help us understand worlds at the edge of our solar system by making the first reconnaissance of Pluto and Charon - a "double planet" (and their four small moons) and the last of the nine traditional planets to be visited by spacecraft. Then, as part of an extended mission, New Horizons will go on to visit one or more objects in the Kuiper Belt region –the solar system's third zone, still farther out than Pluto. Our solar system contains three zones: the inner, rocky planets; the gas giant planets; and the Kuiper Belt. Pluto is the largest body of the icy, "third zone". In the early 2000s, the National Academy of Sciences placed the exploration of the third zone in general - and Pluto-Charon in particular - among its highest priority planetary mission rankings for exploration in the coming decade. New Horizons is NASA's mission to fulfill this objective. Our solar system has three classes of planets: worlds of rock and metal (Earth, Venus, Mercury and Mars) in the first zone, closest to the Sun; the gas and ice giant planets (Jupiter, Saturn, Uranus and Neptune) of the middle zone; and the ice dwarf planets of the Kuiper Belt, the third and most distant zone. There are far more ice dwarf planets than rocky and gas giant planets combined. The ice dwarfs are planetary embryos, whose growth stopped at sizes (perhaps 500 to 2,500 or so kilometers across). This is much smaller than the planets in the inner two zones of our solar system, making the ice dwarfs ancient relics that formed over 4 billion years ago. Because they are literally the bodies out of which the larger outer planets accumulated, the ice dwarfs have a great deal to teach us about planetary formation. New Horizons sought those answers. Pluto's largest moon, Charon, is half the size of Pluto. As such, the pair form a binary planet, whose gravitational balance point is between the two bodies. Although binary planets are thought to be common in the galaxy, as are binary stars, no spacecraft explored one until New Horizons explored Pluto-Charon in 2015. The Kuiper Belt is the major source of cometary impactors on Earth, possibly including the impactor that wiped out the dinosaurs 65 million years ago. Beyond exploring the Pluto system, New Horizons shed new light on the number of such Kuiper Belt impactors as a function of their size by cataloging the various-sized craters on Pluto, its moons. As the first voyage to a whole new class of planets in the farthest zone of the solar system—the ice dwarf planets of the Kuiper Belt, New Horizons became a historic mission of exploration. The New Horizons mission to Pluto and the Kuiper Belt - the first NASA launch to a new planetary target since Voyager more than 30 years ago - allowed the U.S. to complete the reconnaissance of the original nine planets of the solar system known at the birth of the space age. From the 1960s to the 2015 exploration of the Pluto system by New Horizons, the United States made history by being the first nation to reach every planet from Mercury to Pluto with a space probe. New Horizons launched January 19, 2006. It passed Jupiter for a gravity boost and scientific studies in February 2007, and reached Pluto and its moons in July of 2015. In 2016, NASA approved an extended mission, for the spacecraft to head deep into the Kuiper Belt to study the icy mini-worlds in that vast region, including a close flyby of one of these words, 2014 MU69 (nicknamed Ultima Thule), a billion miles beyond Pluto. Sending a spacecraft on this long journey is helping us answer basic questions about the surface properties, geology, interior makeup and atmospheres on these bodies, and the origin of small planets like Pluto. Generally, New Horizons sought to understand how Pluto and its moons "fit in" with the other objects in the solar system. We currently classify the planets into three groups. Earth, Mars, Venus and Mercury are the "terrestrial" planets, which are mostly rock and metal planets. In contrast, the "gas giant" planets, which include Jupiter, Saturn, Uranus and Neptune, are dominated by thick, molecular hydrogen atmospheres, and Uranus and Neptune also contain abundant "ices" (actually water, methane, and ammonia). Pluto belongs to a third category that could be called "ice dwarfs." They have solid surfaces but, unlike the terrestrial planets, a significant portion of their mass is icy material (such as frozen water, carbon dioxide, molecular nitrogen, methane and carbon monoxide). Pluto is the largest object in the Kuiper Belt, a vast reservoir of icy objects located beyond Neptune's orbit and extending out to at least 70 astronomical units from the Sun. The Kuiper Belt is thought to be the source of most short-period comets – those comets with orbits shorter than 200 years – and scientists want to compare the composition and surface properties of Pluto and its moons to those of cometary nuclei. Pluto and its moons are truly part of the current "frontier" in planetary science. Until New Horizons, no spacecraft had ever explored them, yet they promise to tell us much about the origins and outskirts of our solar system.